Light & Darkness Radio: Featured Today! "Wild Steel,CETI..."
, a Progressive Metal band from Genoa. 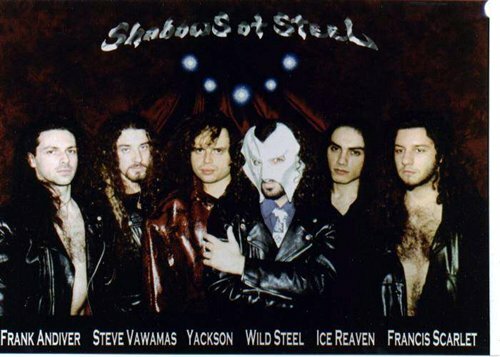 One year later the band changed its name to Shadows of Steel and in 1997 recorded its first album under the label Underground Symphony. It played Power Metal with strong Progressive influences also thanks to Andrea De Paoli on keyboards. The lyrics ranged from fantasy to dreams telling of imaginary people lived in remote ages, and revealing at times autobiographical citations. 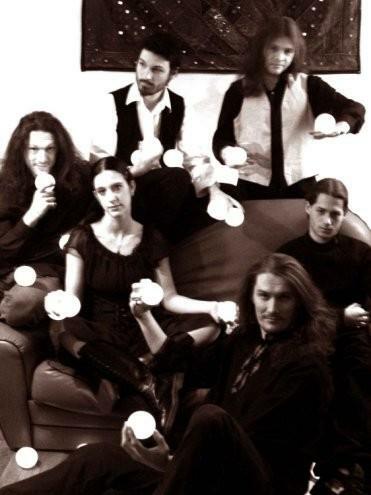 In 1998 the band published “Twilight”, its second album, with the permanent participation of Frank Andiver on drums. Many line-up changes delayed the recording of the third full-length album “Second Floor” that was only released in 2002. As a consequence Wild Steel decided to dedicate himself to something else and in 2003 he produced the debut album of Athlantis, a band with some of Shadows of Steel members and Roberto Tiranti as a special guest. That same year he recorded the song “Angel Cries”, included in “Tears in Floods”, the album of Odyssea, the new band of Pier Gonella. In 2005 it was the turn of Soulblaze as vocalist. Thanks to the gained experience, in 2006 he recorded his first solo album at the New Sin Studios in Loria (Italy), simply entitled “Wild Steel”, with Pier Gonella on guitars and Frank Andiver on drums. In the same period he recorded also a tribute album dedicated to Crimson Glory celebrating the great admiration he had always felt for this American group. The mask that Wild Steel wears during his shows is to celebrate the great Midnight. CETI (POL) - The group was set up by Grzegorz Kupczyk, the vocalist of Turbo, on 12 october 1989. At the beginning it was a kind of a separation from music performed so far. After leaving his original band Grzegorz dedicated himself to solo singing with CETI. The name of the group comes from the NASA programme "communication with extraterestial intelligence" from 1971. The first record "The Black Rose" has appeared on LP, CD and MC. It contains a recording of the guest performance of Czeslaw Niemen. "At Heart's Door" was the first big hit which has been taking first places in the radio and TV charts for many weeks. At that time Grzegorz Kupczyk (voc., bass), Marihuana (kbds), Andrzej Lysow (guit. ), Jacek Jablonski (perc.) belonged to the group. Then Maciej Przybylski (bass) joined CETI. The group prepared the whole recording and made a record of music to the film by Andrzej Szczygiel - "Red Inter Show". The second album '92 - "Lamiastrata" - brought another change. Marcin "Mucek" Krystek (perc.) joined the band. CETI prepared new music and gave many concerts in Poland and Germany. Thorough hardrock music with fairy-tale text was a great success. The title-piece "Lamiastrata" was the biggest hit. The next recording - "Extasy '93" was made during concerts in Germany and Jarocin '92. An excellent production, spontaneous response of the audience and a perfect performance proued that the group is good both at concerts and in a studio. It is also well accepted. The record "Racism" - 1994 - caused a confict between the guitarist and the other members of the band. As a result, the recording proved uninteresting and inconsistent. It was not a commercial success although it was well edited and promoted. However "Epitaph" - one of the pieces - succeeded taking second place in the TV charts and first place in the radio charts. Some other changes came about in 1995. Przemyslaw "Burza" Burzynski (guit.) and Bartek Urbaniak (bass) joined CETI. Working unusually peaceably and constantly they prepared new material "In The Name Of Law". Critics and fans of modern metal found it very good. That kind of music fluctuates between White Zombie, Sepultura and Dream Theater. The record was edited by Metal Mind Records. The same firm edited records of Turbo in Poland and abroad in the 1980's. That year Grzegorz Kupczyk together with Janusz Musielak recorded music for the television theatre to the play "Mick Jagger's Mouth". The play took second place for music and screenplay. The first solo record "My Birthday - 15 Years" - appeared that year. It was a summary of 15 years of concert activity. Among invited guests there were Malgorzata Ostrowska and Grzegorz Strozniak (Lombard), Grzegorz Skawinski (ONA), Marihuana (CETI). The record was edited for the second time in 1998. It contained the later big hit "500 Miles" used in an advertisement of "Lezajsk". According to the plebiscite "The Golden Twenty", published by the magazine Metal Hammer, the album "In the Nmae Of Law" took sixth place and Grzegorz - fourth place as a vocalist in 1999. The twentieth anniversary of artistic activity was a good opportunity for giving a concert on 20 january 2000. There were all the groups Grzegorz had performed with: Turbo, Non Iron, CETI. The concert was an unprecedented fact and was called "the event of the year". It will appear as the record Grzegorz Kupczyk and his friends. At the end of the year 2000, the next album "Demony Czasu" ("Demons Of Time") has been released under the label of MMP. Many critics described this one, as the best band's release - very positive reviews, and number of sold copies can only attest their opinion. The year 2001 was the year of giant success: Grzegorz has been nominated to the "Wodnik" prize for his whole work, and the readers of the Metal Hammer Magazine choosed him as the fourth personality of the year 2000, fifth vocalist of the year. Album was choosed as the fifth album of year, song "Feniks" as the fourth track of the year. And the readers of teh Thrash Em All Magazine, choosed him as the ninth vocalist of the year. On the Metal Hammer's sum up of the year 2001, he was choosed as the personality of the year (first place!) and took the second place as the musician. People from the Metal business (both from Poland and abroad) are still very interested in the "Lamiastrata" and "Extasy '93". In 2001 CETI started the cooperation with Oskar Records from Poznan. It had an effected with reeditions of three previous albums that included unique audio tracks & video footage. The reception of the cd- version of "Lamiastrata" was a great surprise even to the band. They received a very warm welcome all over the world, and the lp got nice reviews (True Metal Magazine/Greece, Hellion/Germany), interview proposals (Malaysia) and a great deal of fan interest a good example of that is one music store in Tokyo that sold over 50 cd's during two weeks time. The band's management (Dragonight Agency) that is doing international affairs, is considering a few deal proposals from the labels interested in editing "Lamiastrata" in vinyl, or having a special version for South America. "Lamiastrata" is being distributed ian all western Europe and the USA. In September 2002 there was released a warm-up to the upcoming "Shadow of The Angel" album -"Prolog" single by OSKAR RECORDS. The new material is being found extremely interesting for polish and foreign record labels. The "Shadow of The Angel" lp was released in April 2003 with another than it was planned, interesting design, projected by Jacek Wisniewski. Also, special guests appeared - Steve Adams of Mirage and Peter of Vader. Invited by the Polish community in France, the band went to play gigs in Paris. Yet another warm welcome effects in closing relationships and concert plans for the future. 2003 is also a year, when Grzegorz, being not satisfied with the cooperation with MMP, leaves Turbo again. The news was shocking to the polish metal world and painful to the fans that reacted with lots of letters and internet signs on the sites. Having that in mind, he joined the group once more, although he still shows his disregard to MMP. The year 2004 is a year of changes and success for CETI. There was a great sold out 15th Anniversary gig that was recorded as a double-cd live album and DVD on the 15th February. After two years of hesitancy, Piotr "Burza "Burzynski left the band. They tried to fight for him, but the general lassitude and his beliefs, dangerously drifting into ecclesial direction, finally won. The split - up luckily happened in friendly atmosphere. Burza was replaced by Bartek Sadura who comes from Gdansk. The new line-up was warmly welcomed by the fans. Right now the boys are making preparations to another concerts abroad and a tour with Vader. March 2007 - premiere of the first in 4 years studio album titled "(...) Perfecto Mundo (...)", which is an interesting combination of Heavy Metal and Classic music. Release gets fantastic feedback in the day of showing up in the music shops. Special guest on the album is Sylwia Kupczyk (daughter of Grzegorz), who sung together with Marihuana vocal parts in the "Ride To Light" song. Technology ETP, leading producer of the microphones, mixers, speakers and other stage equipment..
Auspex (FRA) - Created in 2001, Auspex was born from a meeting between two friends being both into classical music and metal. The arrival of the different members makes Auspex complete and a period of hard work begins, leading to new songs and new stages. In 2005, the band finally managed to achieve its first main project: the first mcd called "mysteries of the stars". The enthusiastic reviews and the good sales allow the band to plan the recording of 0a full length album. In 2006, the first full length album is recorded with the help of the gifted producer Brett Caldas-Lima, allowing the band to sign a deal with Thundering Records.